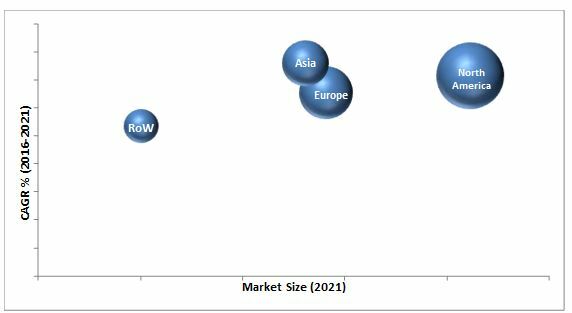 [157 Pages Report] The global biomarkers market is estimated to reach USD 53.34 Billion by 2021 from USD 27.95 Billion in 2016, at a CAGR of 13.8% from 2016 to 2021. The global market is segmented on the basis of product, type, application, disease indication, and region. On the basis of product, the Market is segmented into consumables, services, and software. The consumables segment is estimated to account for the largest share of the global market in 2016. The large share of this segment is primarily attributed to the lower price of consumables than that of screening and automation instruments. On the basis of type, the Market is segmented into safety, efficacy, and validation. The efficacy segment is further classified into predictive, surrogate, pharmacodynamic, and prognostic. In 2016, the safety segment is expected to account for the largest share of the market. However, the efficacy biomarkers segment is estimated to register the highest CAGR during the forecast period. On the basis of application, the global Market is categorized into diagnostics, drug discovery & development, personalized medicine, disease risk assessment, and other applications (DNA fingerprinting, ecotoxicology, and forensics). The diagnostics segment is estimated to account for the largest share of the market in 2016. Factors such as increasing prevalence of cancer, increased awareness and acceptance of diagnostic tests, technologically developed biomarker products, and individualized treatments for cancer are driving the growth of this segment. On the basis of disease indication, the market is categorized into cancer, cardiovascular disorders, neurological disorders, immunological disorders, and others (renal disorders, urinal diseases, diabetes, and tuberculosis). The cancer segment is estimated to account for the largest share of the global market in 2016. Cancer forms the largest segment primarily due to the increasing prevalence of cancer globally and the growing application of biomarkers in cancer diagnostics. Growth in the Market is mainly driven by factors such as increasing diagnostic applications of biomarkers, increasing R&D funding for pharma and biotech companies, increasing number of CROs and low cost of clinical trials in developing countries, the high prevalence of cancer, and new initiatives for research. On the other hand, high capital investments and low cost-benefit ratio, poorly suited regulatory and reimbursement systems, and technical issues related to sample collection and storage are the major factors restraining the growth of this market. The biomarkers market is dominated by established players such as QIAGEN N.V. (Netherlands), PerkinElmer, Inc. (U.S.), Merck Millipore (U.S.), Bio-Rad Laboratories, Inc. (U.S.), and Enzo Biochem, Inc. (U.S.). The global biomarkers market is projected to reach USD 53.34 billion by 2021 from USD 27.95 billion in 2016, growing at a CAGR of 13.8% during the forecast period. On the basis of type, the market is segmented into safety, efficacy, and validation. The safety biomarkers have widespread applications in the drug discovery and development. Hence, this segment is estimated to account for the largest share in 2016. The efficacy biomarkers segment is further segmented into predictive, surrogate, pharmacodynamic, and prognostic biomarkers. The predictive segment is estimated to account for the largest share of the market in 2016. The large share and high growth of this segment can be attributed to the wide applications of predictive biomarkers in personalized medicine and companion diagnostics. On the basis of disease indication, the market is categorized into cancer, cardiovascular disorders, neurological disorders, immunological disorders, and others (renal disorders, urinal diseases, diabetes, and tuberculosis). The cancer segment is estimated to account for the largest share of the market in 2016 due to the increasing prevalence of cancer worldwide. The key players operating in the biomarker market are Qiagen (the Netherlands), PerkinElmer (US), and Merck Millipore (US). A majority of the leading players in the market focus on the strategy of product development. Players also focus on expanding their distribution networks by pursuing inorganic growth strategies such as agreements and collaborations. This enables them to cater to the increasing demand from consumers and provide easy-to-operate and efficient. 12.6 EKF Diagnostics Holdings, Inc.
12.7 Meso Scale Diagnostics, LLC.